"Boulder opal" is a term used for a rough or a cut gemstone that displays opal within its surrounding rock matrix. 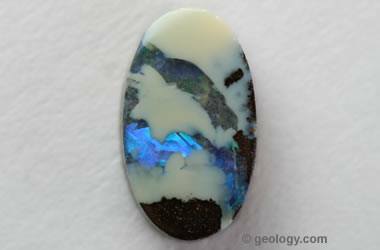 Opal often forms within voids or fractures in its host rock, and specimens of boulder opal reveal this aspect of opal's origin. 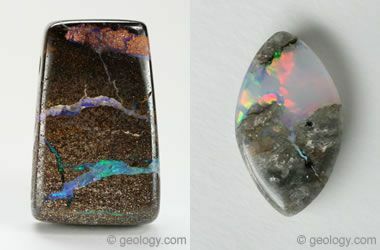 The contrast of color can be striking when a bright flash of opal is seen within the surrounding rock material. Many people enjoy the natural appearance of boulder opal and find these gemstones to be beautiful, interesting and educational. The specimens shown here are boulder opal beads cut from Australian boulder opal.